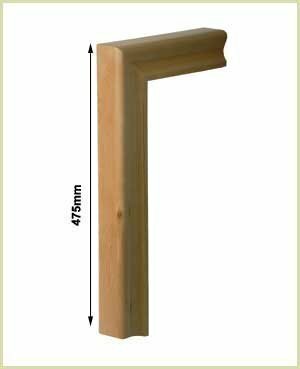 The best method for installing the vertical turn system is to draw out all the details in full size, of a side elevation onto an 8'x4' of sheet material or similar (the wall accommodating the wall string is ideal). Mark out all the details including the handrail position/height above pitch line, the newel positions, the tread and the riser details. 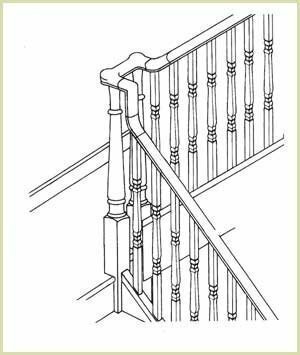 This will give you a solid foundation in establishing lengths, angles of cuts and newel post heights. 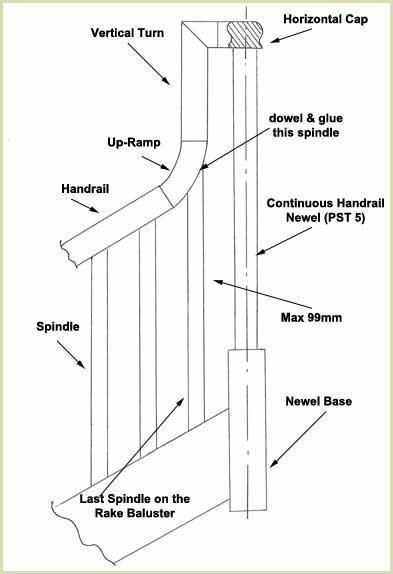 During assembly it is good practice to lay the overlong handrail lengths with fittings attached to the stairs, resting on the staircase nosings and also, using an extra pair of hands, assemble to side of newel posts, checking that the angle of cuts to ramps and lengths of the vertical turn are correct. 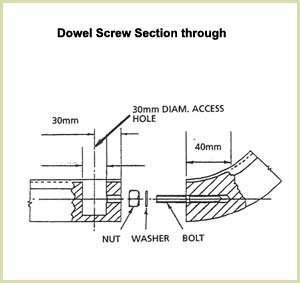 All handrail fittings and ramps are joined to handrails and each other using dowel screws. 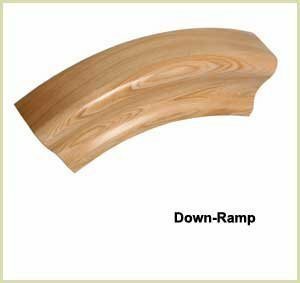 Handrail fittings/ramps are used to change the direction/pitch of handrails. 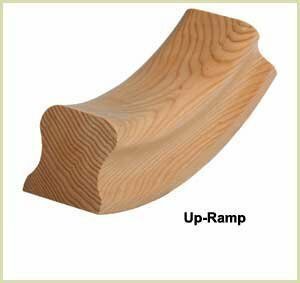 These ramps (up-ramps and down-ramps) are supplied overlong to suit the majority of staircase pitches and will need to be cut down to suit individual requirements. 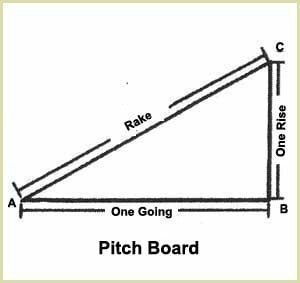 To mark and cut the angles of ramps use a pitch board which is a triangular piece of plywood with the sides the same rise, going and pitch as a single step of the stairs. 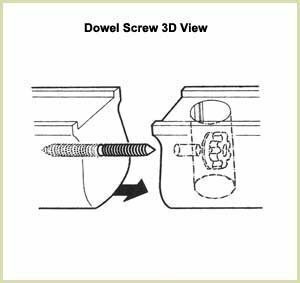 Place the handrail fitting and pitch board onto a flat surface and offer the pitch board to the underside of the handrail fitting/ramp. 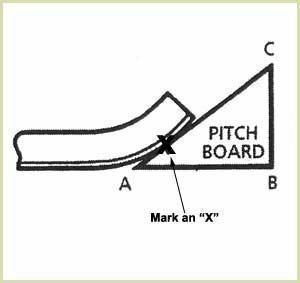 At the centre where the hypotenuse of the pitch board touches the ramp mark with a pencil "x". Reverse the pitch board and align the marked point "x" on the handrail with the B-C axis. Scribe a pencil line onto the handrail fitting to give the angle of cut. The overall length of the vertical arm of the vertical turn is 475mm. This is usually longer than required when used with the continuous handrail system and will need to be cut down to suit. 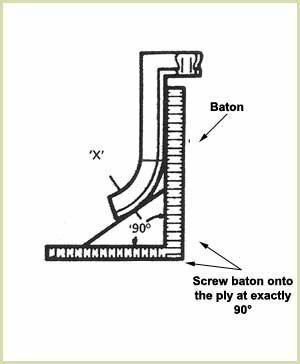 Using the full size side elevation previously discussed, screw baton onto a piece of ply at exactly 90°, establish the length of the vertical turn and angle of cut of up-ramp required. Mark the up-ramp for joining the pitching handrail using the pitch board. 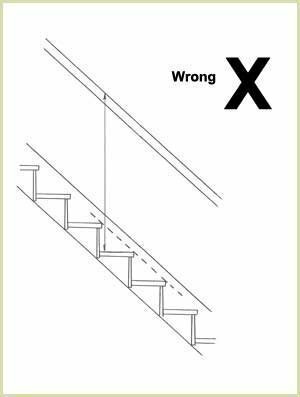 You should note it is not necessary to cut both faces of the up-ramp when used at the top and bottom of the stairs. The face to be cut is the one adjoining the handrail length. 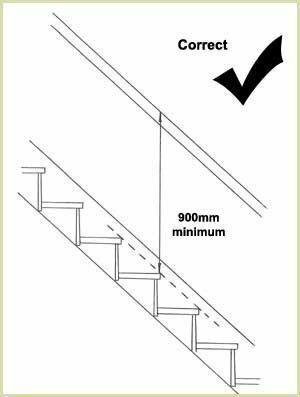 Please Note - when on site the rake handrail height is not taken from the tread upwards. The rake handrail height (of a minimum of 900mm) is taken from the end of the nosing to the top of the handrail. 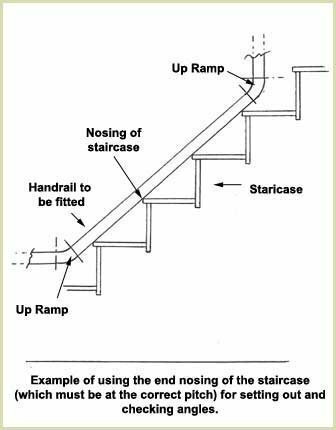 But Pear Stairs do not recommend the use of continual handrail at points on the staircase that have extra risers, e.g. winder flights, as the stability of the vertical turn cannot be guaranteed due to the extended length required. 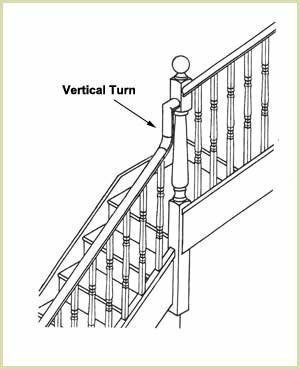 The horizontal cap turn is used where the staircase turns through 90° (e.g. quarter landings). 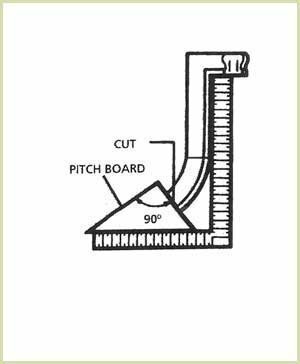 Use the full size side elevation, drawn on your ply, to establish cuts and lengths where the horizontal cap is used with a vertical turn, the overall reach of the two components when joined together should ensure that there is a maximum gap of 99mm. 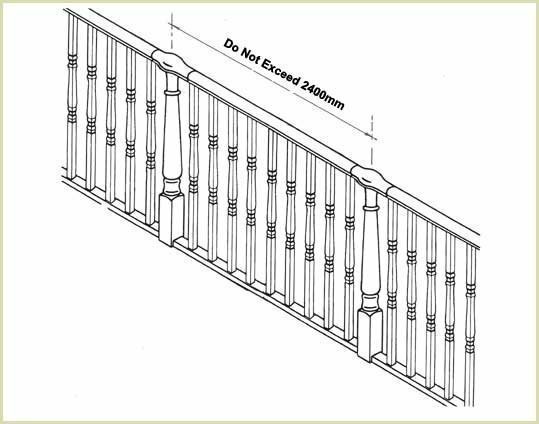 This 99mm maximum is U.K. regulation, this is why it is important to set out the above drawing on a piece of ply, this will also ensure that your last spindle on the rake baluster will also fit. 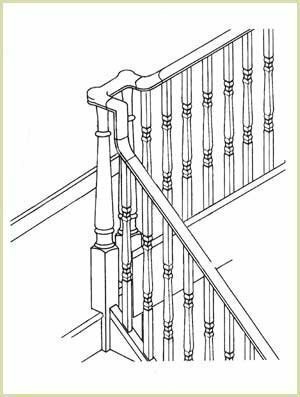 The straight cap is used over the top of a continuous handrail newel with horizontal balustrading. 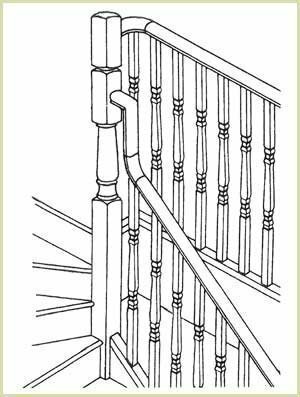 Please Note - that for strength you should not exceed 2400mm between continuous handrail newels. 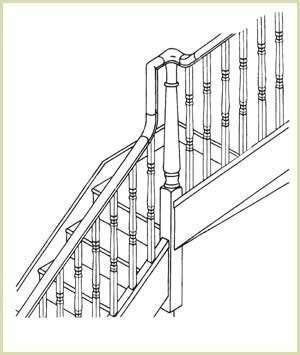 Pear Stairs sell staircases and stair parts for continuous handrails with vertical turns, should you require further information, don't hesitate to phone us. We are a very friendly company, phone Pear Stairs on 01938 553311.